The puppy had big feet just like a moose. one up, one down--thick black curls hanging loose. He was an Airedale mix, solidly built. The Berkeley life was perfect for the dog. he followed her most everywhere she'd go. for her to settle...or a tumor grow. She sent for him. By then it was too late. and every time she thought of him she cried. Once in a while I can remember love. out of my mind, now that those days are through. and yet, what a relief that you were here. so many long years buried in the ground? Wendy Sloan is an attorney living in New York City. Her poems have appeared in The Raintown Review, Measure, Umbrella Journal, Blue Unicorn and Iambs & Trochees, among other publications. A translation (Leopardi) was published in The Chimaera. 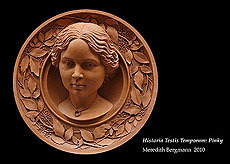 Wendy was a finalist in the 2006 Howard Nemerov Sonnet Award Competition.